reduce both patient and refractionist visual stress. · potentially save doctors and patients’ time and money in determining visual needs. 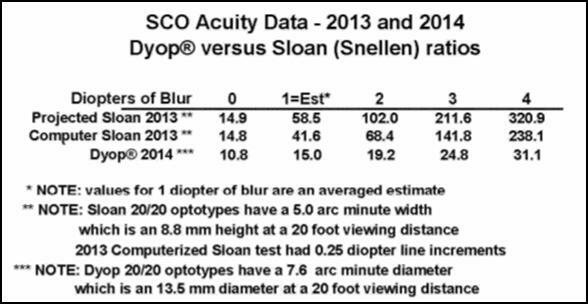 Dyop® acuity tests are intended to be a more precise and faster to use replacement for Snellen, Sloan, and Landolt visual acuity/refraction tests. Dyop® tests use apparent motion detection from the strobic stimulus and refresh rate of the photoreceptors to determine the visual acuity and refraction endpoints. Snellen letters are culturally derived, NOT proportional, and do NOT provide a consistent basis for determining visual acuity. As a result, Dyop® tests are more accurate and efficient than the 1862 classic Snellen test, and create a visual acuity test based on physiology rather than subjective and imprecise cognition. Dyop® tests enable patients to have a visual acuity endpoint which avoids overminused refractions which seem to be inherent with static image fixation. It is typically difficult for patients to perceive when optotypes are "too crisp" (over- minused), despite the discomfort and visual stress, which is one of the inherent inadequacies with Snellen and other static image tests. Dyop® tests determine visual acuity based upon photoreceptor physiology with a precision (approximately +/- 0.06 diopters) not previously available with traditional static image visual acuity tests. Unlike static image tests, which may be dependent upon cognition as much as they are for visual acuity, Dyop® tests also maintain a higher level of accuracy as visual acuity decreases with increased blur. The 2013 projected Sloan optotypes are “fuzzier” than the 2013 computer generated Sloan optotypes, and thereby give a “fuzzier” acuity response. The 0.54 arc minutes squared Dyop® visual stimulus area (the arc width of the gap/segments) is smaller and inherently more precise than the 1.0 arc minute squared visual stimulus area (the “Minimum Area of Resolution”) of Snellen/Sloan/Landolt optotypes. The 0.54 arc minutes squared Dyop® visual stimulus area correlates to about 20 photoreceptors. Fixating on static Snellen/Sloan images also increases accommodative stress, which leads to an overminused acuity response and possible overminused refraction. The visual dissonance/stress from an overminused refraction is frequently a major reason for patients’ complaining about their lenses and/or not wearing their lenses at all. The Dyop® Acuity/Refraction Test can be used on virtually any personal computer system with minimal setup-up and training. Dyop® vision testing should increase the accuracy of prescriptions, let patients more easily know when their vision is not proper, maintain higher practitioner testing consistency, and potentially save doctors and patients’ time and money when getting their vision checked. Visual acuity measurement in increments of +/- 0.25 diopters was acceptable and adequate in 1862 because of the difficulty of making lenses more precisely than +/- 0.25 diopters. Visual testing in increments of +/- 0.25 diopters was also adequate because of the small percentage of the population able to read, or needed to be able to read. Note: Dyop® tests are for vision screening purposes only and are NOT a substitute for an examination by a licensed vision care professional. Copyright©2019 DyopVision™ Associates. All Rights Reserved.